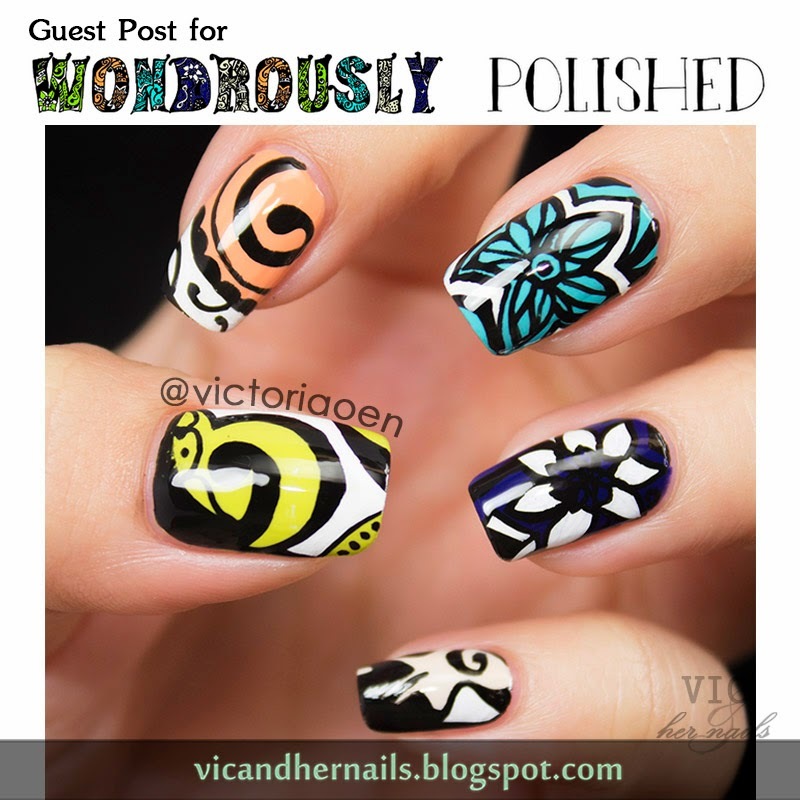 Hello all lovely readers of Wondrously Polished! 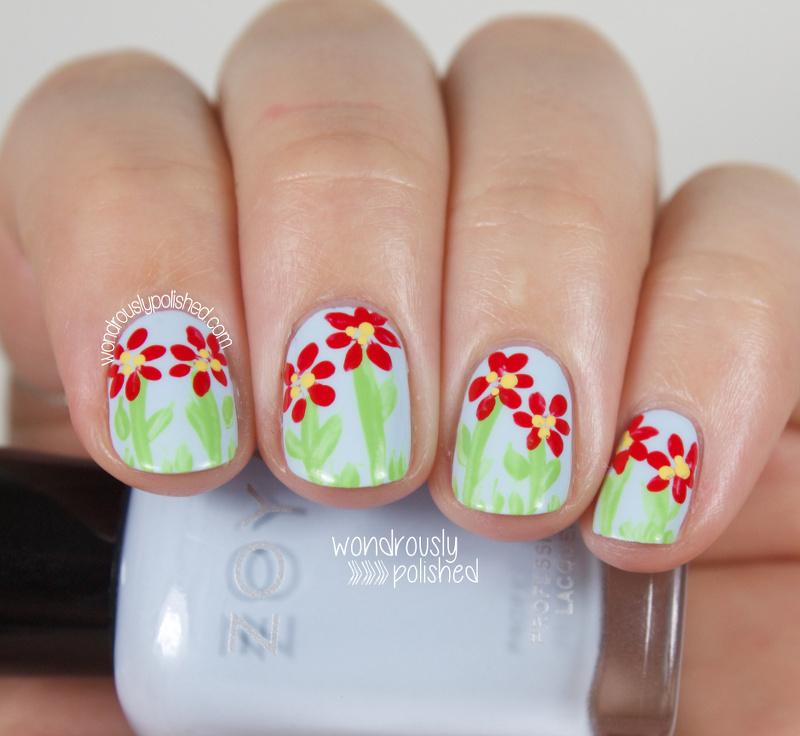 Victoria Oen from Vic and Her Nails here. I'm very happy and honoured to do a guest post for Lindsey today! 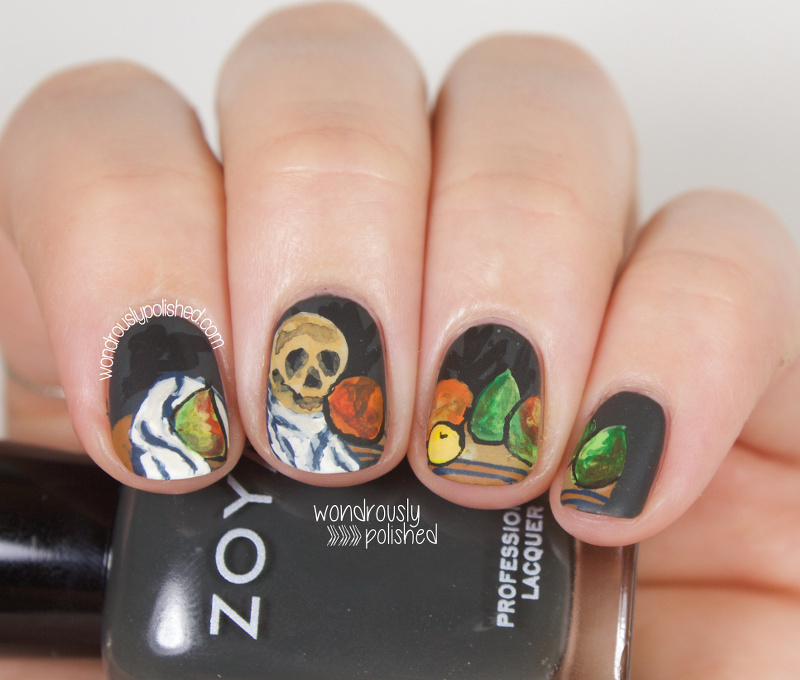 She's one of my favourite nail bloggers and her nail art designs never fail to make my jaw drop. 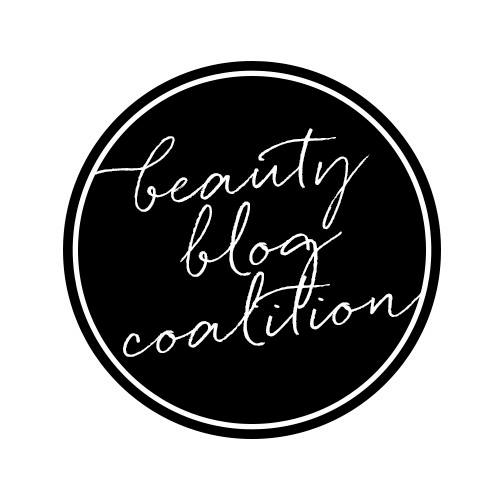 I really love her blog so it's very exciting that I'm posting on it! Thanks a lot, Lindsey! Hello, all! I'm taking a bit of time off and enjoying the peace and quite that camping provides for a bit, so I've asked a few of my favorite bloggers to help me out with some guest posts! 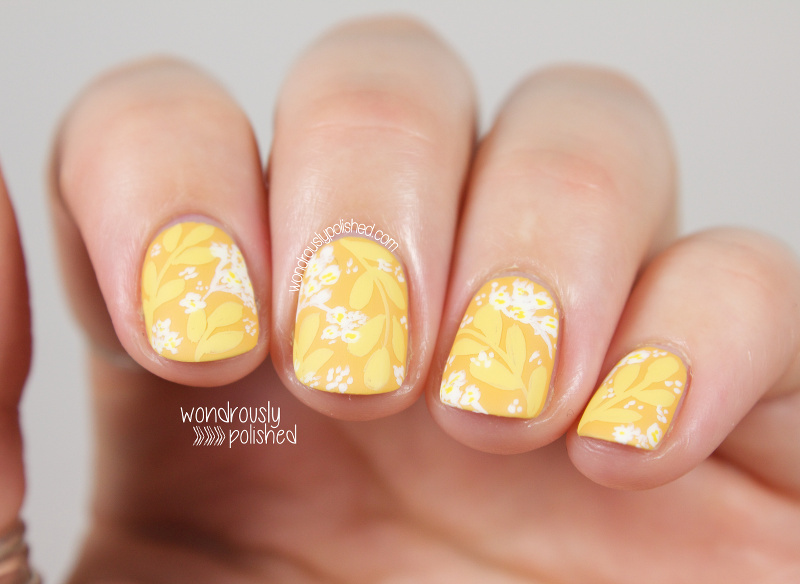 First up, is Debbie from The Crumpet and I'm so incredibly honored to have her on my blog! 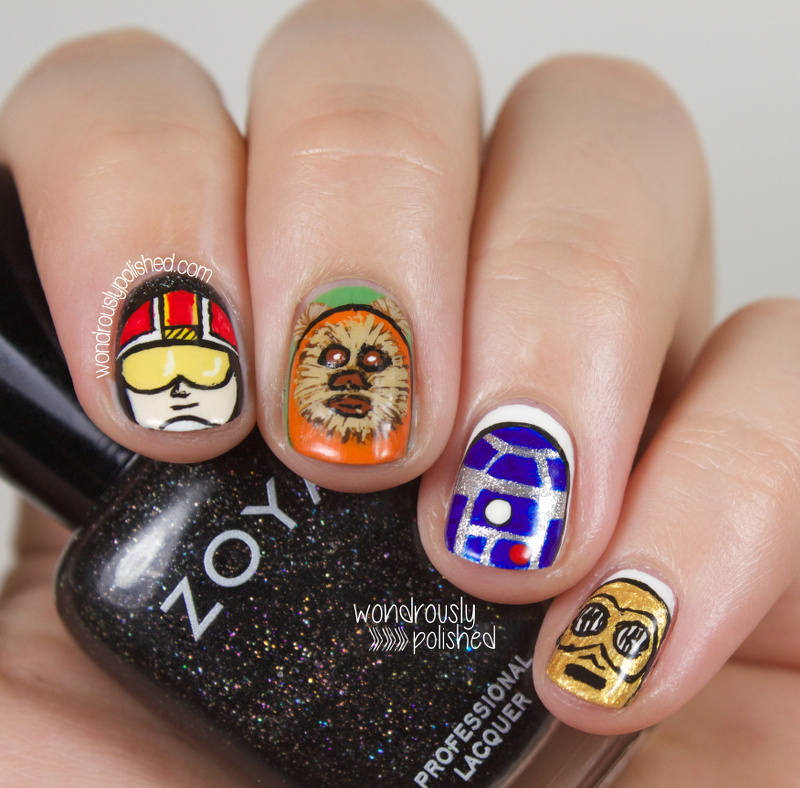 She was one of the first bloggers that I read when I first got involved in nail art and she is such a positive light in the nail community. 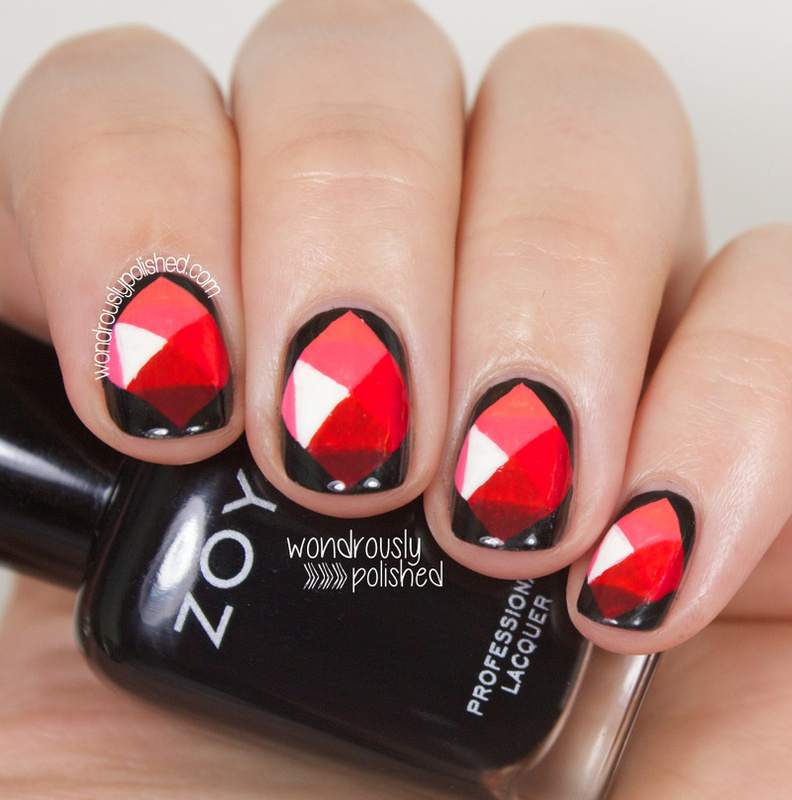 Not only does she run a ridiculous number of online nail groups she also provides endless inspiration to all those around her with her creative challenges and stunning nail art and swatches. Her blog was also the first guest post I had ever done, so it only seems fitting that she is the first guest post ever on my blog! Love what she's come up with and so happy to have her! Lindsey is off on vaycay, so today you have me, Debbie, from The Crumpet to keep you company. Happy Monday! 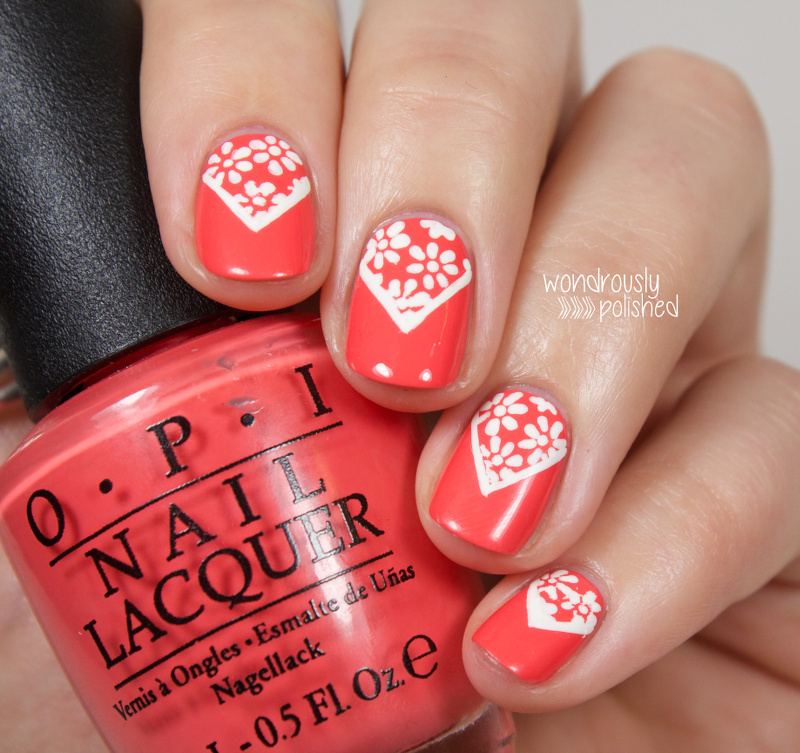 Time for another Mani Monday look :) This time I was inspired by this coral floral piece over on the Hunt. Be sure to check out blog.thehunt.com to see my simple how-to and let me know what you think! Hello, all! Hope everyone in the States is having safe and happy Memorial Day weekend. 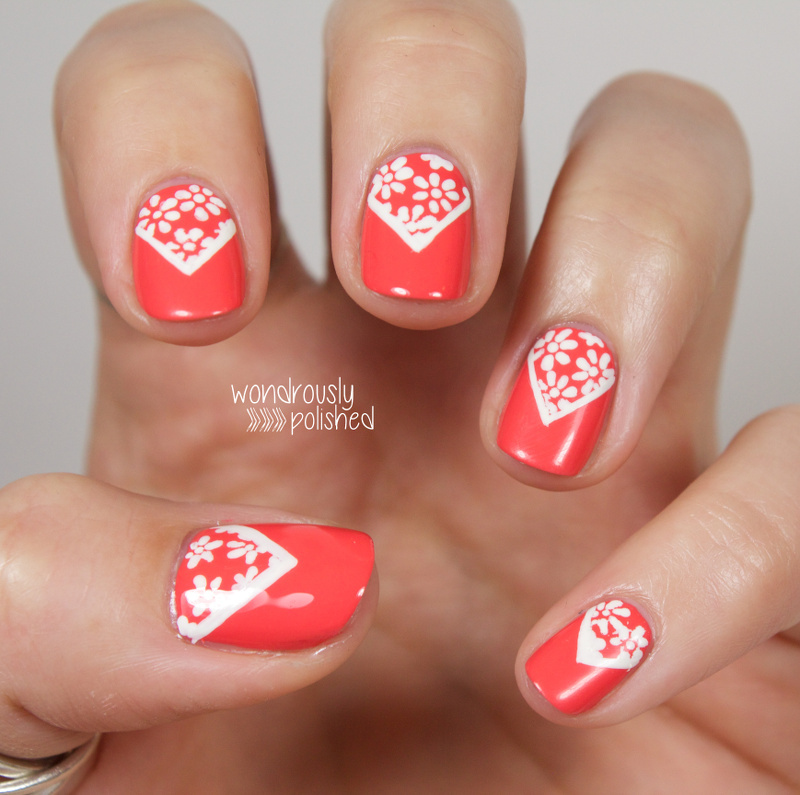 Today I have a review of some awesome nail stencils and some lovely polishes to share with you! Sticky Nails nail stencils and Pretty Jelly nail lacquer have teamed up to bring us 2 really fun sets inspired by the story of Sleeping Beauty (and the upcoming Maleficent movie)! I love this collaboration! Liz and iona have come up with a set inspired by Princess Aurora and a set inspired by Maleficent. 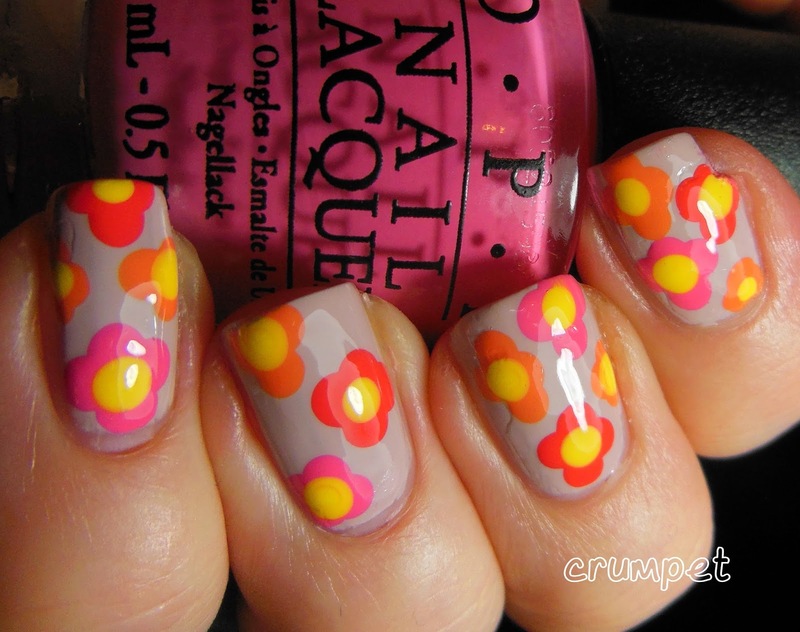 One is bright and happy and the other is darker and more sinister and I think these ladies did a great job of capturing the essence of these characters with their polishes and stencils. The "I Know You" set is the Maleficent inspired set and is my personal favorite of these two because it feels so badass ;) The Pretty Jelly polish is a deep steely grey green holo and it is fantastic in person. The color feels so spot on to me as Maleficent! Can't you picture Angelina Jolie rocking this shade in the upcoming movie?? Shown is 2 coats and the formula was excellent. Hello, all! One of my Digital Dozen colleagues , Hannah, from the Dalai Lama's Nails recently went on vacation to Cancun (yes, we can all be jealous!) 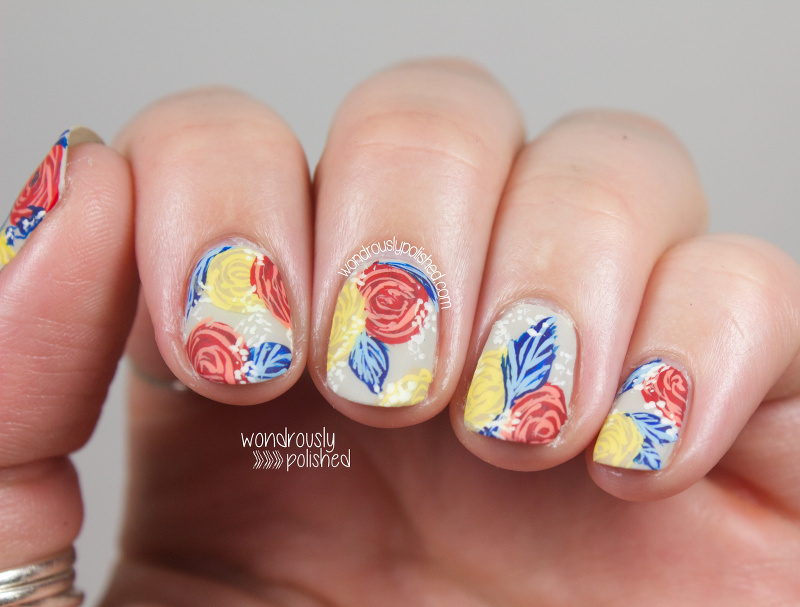 and so I helped her out while she was away with a fun little guest post! Head to her blog to see my post with more photos and info! Happy Monday, all! 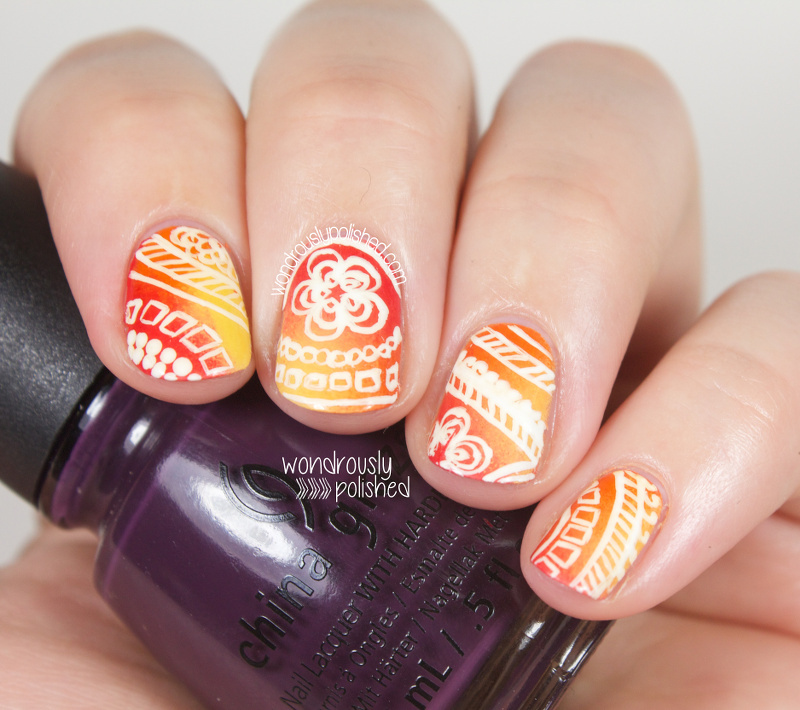 It's Mani Monday time over on The Hunt and I've put together another cute tutorial for you all! 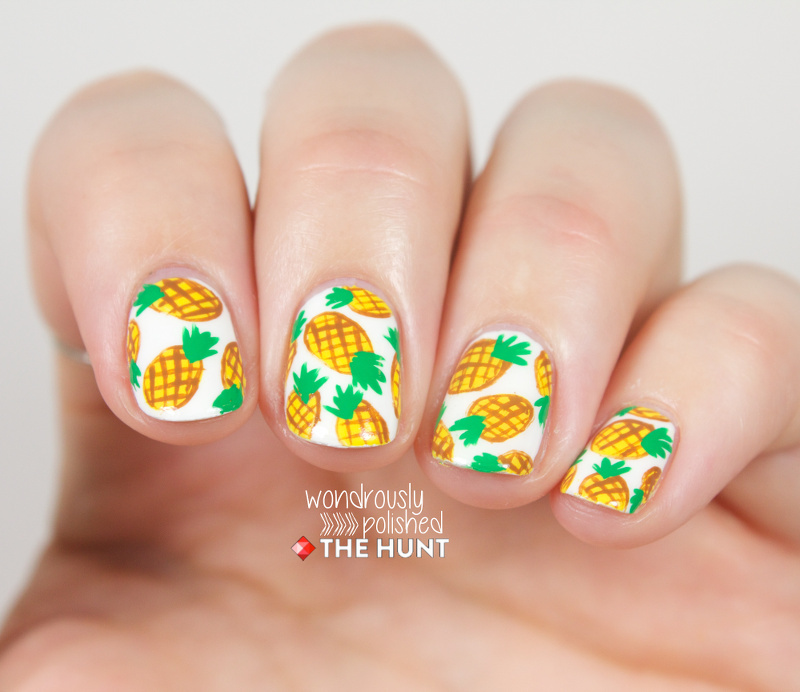 I was seeing tons of adorable pineapple prints popping up in Hunts and couldn't resist putting something together inspired by them. 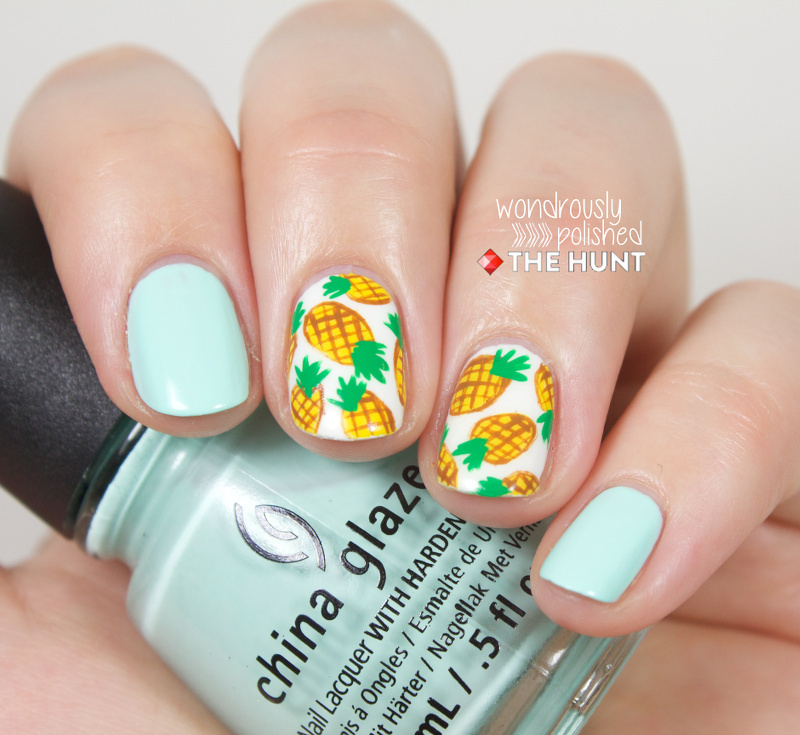 Not going to lie, kind of obsessed with these little pineapples! Head to blog.thehunt.com to check out my easy how-to for this look! Oh man, hold onto your seats, everyone! 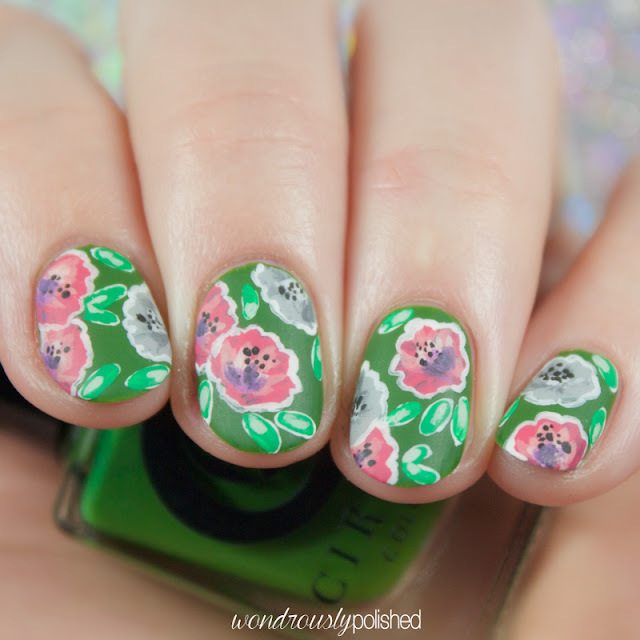 I've got another Nail-Art-A-Go-Go post to share with you today! I know, it's shocking ;) Today I'm tackling the "Night Sky" theme...which was due last Monday...but let's not talk about that! I'm almost caught up...almost! I was a bit stumped for what to do for today. 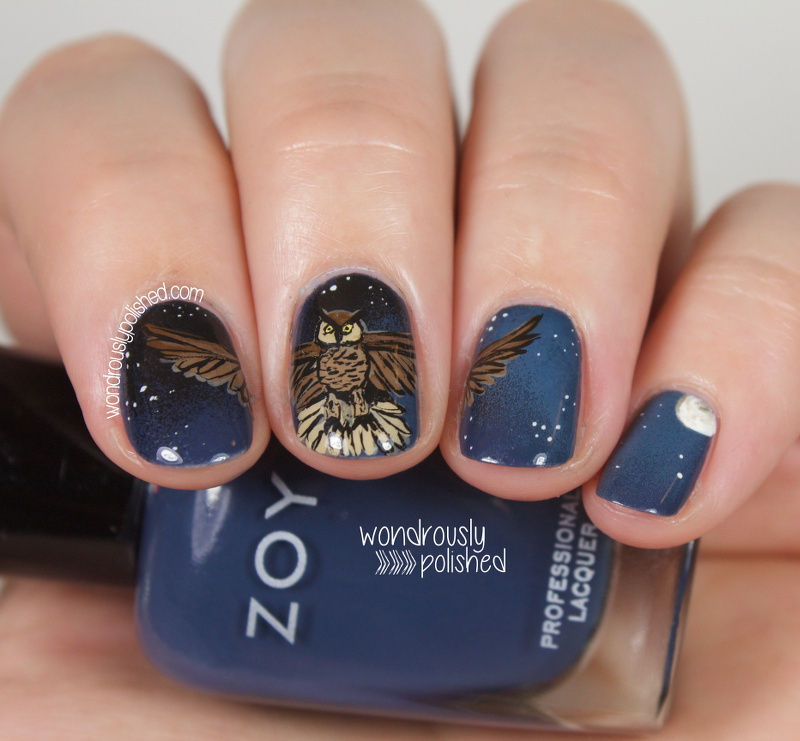 I've done a few night sky scenes (my favorite being the inspired by a song mani) and I didn't want to do something too similar to those for today. I did as I often do when I'm at a loss for inspiration, and started browsing google. And came across an image of an owl in flight and my inspiration began to flow! Man, if you all had a nickel for every time I've said I'm going to get caught up on something "soon", you'd have like...100 nickels...which isn't exactly rich, but you could probably buy a tasty ice cream somewhere or something ;) Anyway, I'm STILL trying to catch up on the NAGG challenge and I'm a full week behind Mireia which I'm feeling terrible over. Tonight's theme is "Inner Geek" and to me, my inner geekiness is my absolute love of fantasy novels. It's an absurd love but I will read anything fantasy. My love for the genre started back when my mom took me to get my first library card and I somehow ended up with the book The Blue Sword by Robin McKinley as one of my first checked out items. I was immediately hooked and I've looked back. To this day, when I see the cover of that book, I get excited and the thrill I felt when reading it the first time comes back to me. I'd definitely recommend it for any fantasy lover! To commemorate the start of my fantasy love, I decided to attempt the cover of The Blue Sword. 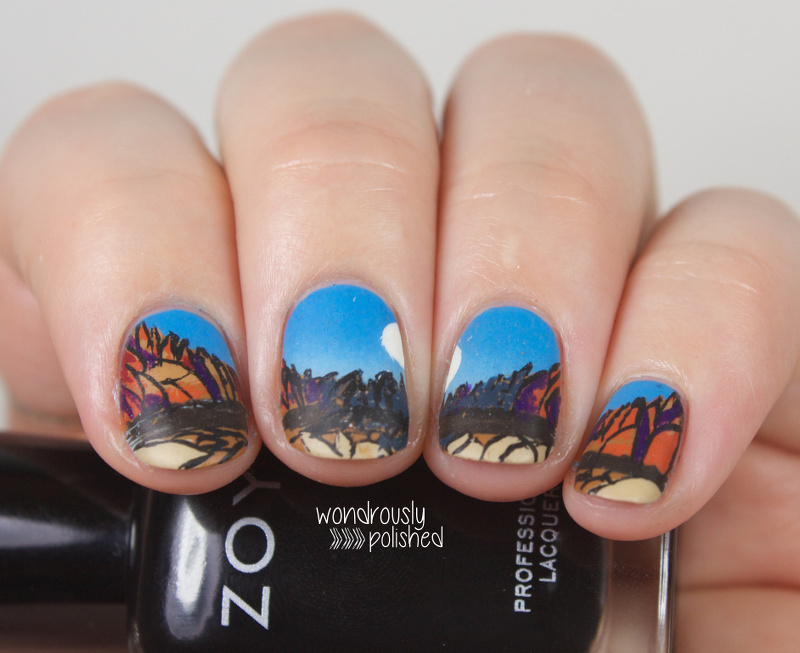 The book is set in a desert landscape and I love the artists take on the rocks and mountains but making them choppy and somewhat abstract. Hi all! Happy Monday! I'm very excited to share that I'm going to be partnering with the lovely folks over at The Hunt for the next few months do do a Mani Monday tutorial each week! They have recently done a soft launch of their blog, with a full launch coming next week, and you can see all my future looks over there soon :) You can also easily browse their iPhone app to post and find hunts, as well as just browse for general inspiration. Ahh, you guys! I've been so busy! I'm sorry I've been so sporadic in my posting and that I always seem to be behind. Sometimes I like to take on too many things and then wonder why I'm so tired and don't have time ;) I'm slowly catching up with the NAGG challenge (Mireia has been kicking some booty with her looks!) and today is all about Still Life! 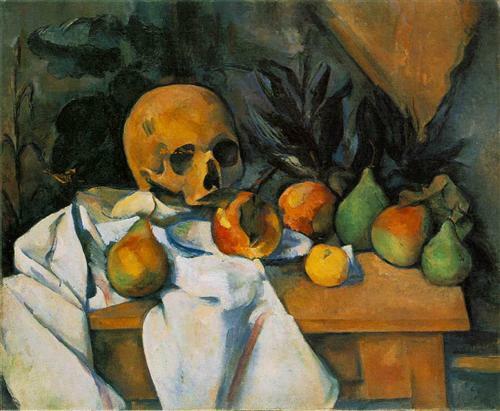 One of the first images that pops up when you type "Still Life" into google is this FANTASTIC painting by Paul Cezanne and I just love it. So much. That page has been sitting open on my computer for a week and every day I've been wanting to do it. So, I finally made it happen tonight! All said and done, if you were to purchase these products individually, it'd cost you almost $31...and the summer grab bag is just $10 ($9 if you use my code at the bottom!). 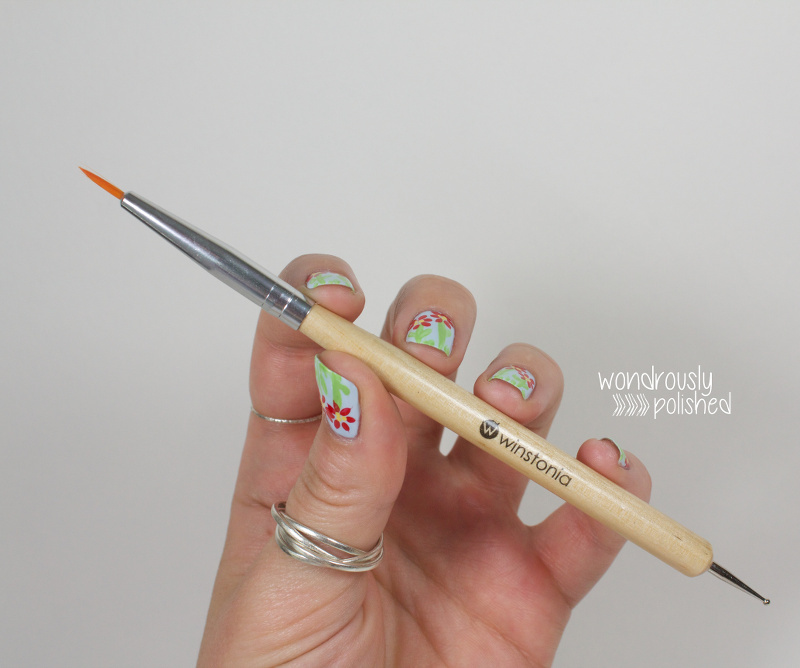 First up, let's look at the two-way detailing brush & dotter. As an avid reader, I always love seeing a new fantasy novel make its way to the shelves. One of my favorite authors, Jennifer Donnelly, has recently come out with a new novel in a genre that has yet to be tapped...and I'm pretty excited about it! 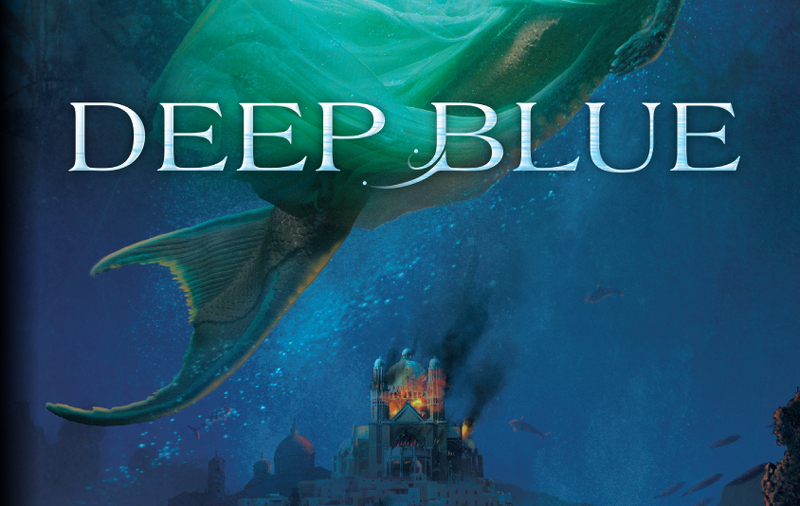 DEEP BLUE is the first novel in a series of epic tales set in the depths of the ocean, where six mermaids seek to protect and save their hidden world. Yes, mermaids! I love it! While reading the book, I became enthralled by the world that was being woven and couldn't resist creating my own "under the sea" look (and tutorial!) 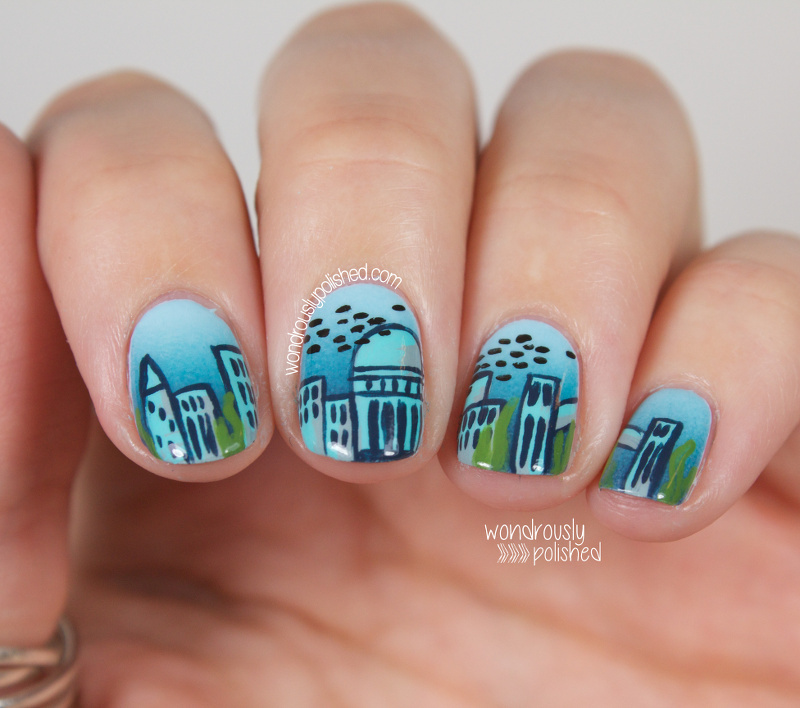 inspired by the mermaid city created in DEEP BLUE. Read on to see my how-to for creating your own underwater world! As many of you already know, this year's color of the year is Radiant Orchid so it's only fitting that our group gave it a shot. I decided to take a very literal approach to this theme and went with painting an orchid instead of doing something more abstract with the color. 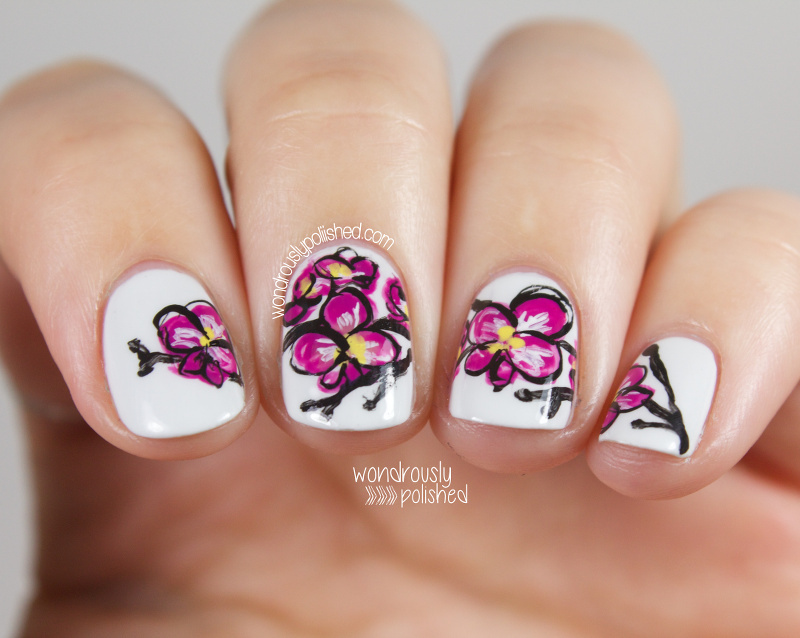 And because I've never painted orchids before, it was a fun challenge for me. Hello, all! 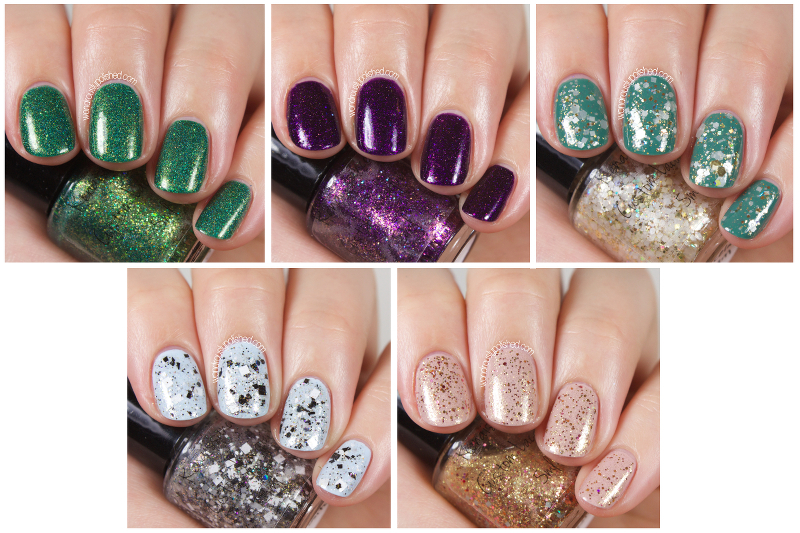 Happy Sunday :) Today I have some swatches of this month's The Glitter Box, a monthly indie polish box! I really love what these indie makers come up with each month (and that they include a guest indie each month to add even more variety) so I always love seeing each of their takes on the theme. This month was a theme of "Rainbows"...and really, who doesn't love rainbows?? Hi, all! 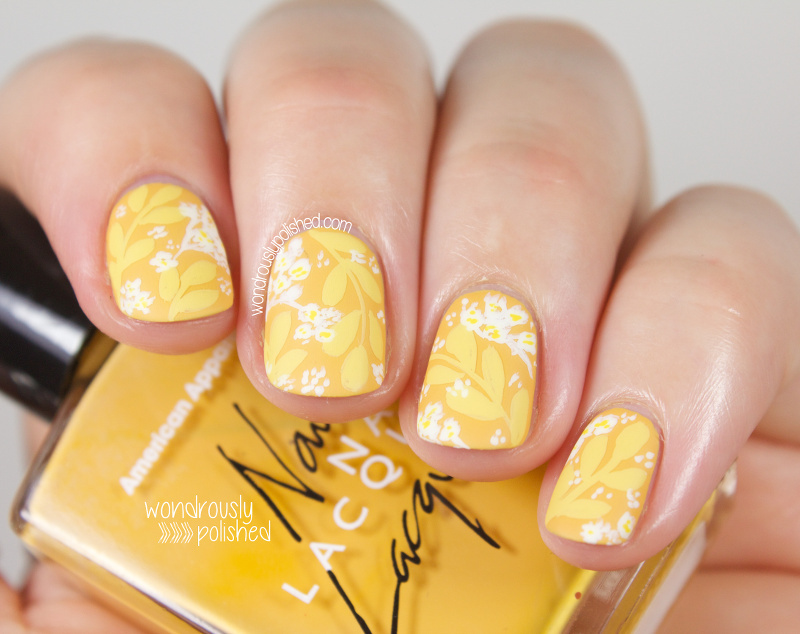 I've got my latest Nail-Art-A-Go-Go mani to share today! The theme this time around was "Primary Colors" meaning red, yellow and blue. Primary colors are rough to work with in my opinion. Outside of baby products, they just don't really do it for me so I wasn't really looking forward to this prompt. I browsed online for awhile but found nothing particularly exciting related to primary colors. As I've mentioned before, I love being inspired by patterns and prints and my favorite go-to resources are catalogues. I especially love Sundance and decided to flip through one of the recent catalogues sent to me and I came across a PRIMARY COLORED ROSE shirt! It was basically fate. 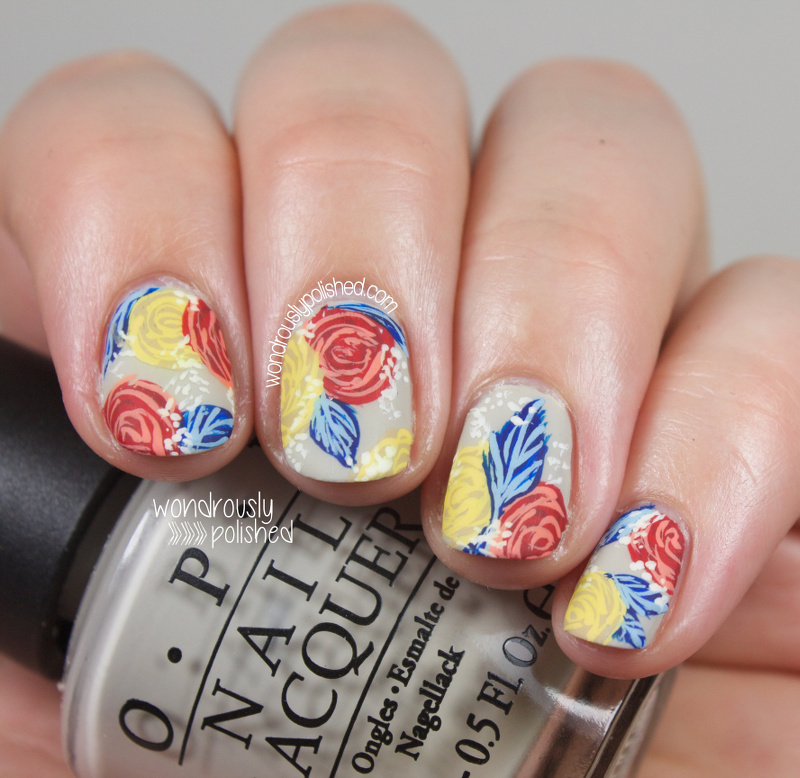 The polish gods opened up the heavens and combined floral (my favorite!) and this theme.